Weight-bearing exercise may be too painful or risky for many patients, such as those with arthritis or those who have had a stroke or recent surgery on the knee, hip, back, or neck. But the anti-gravity treadmill, also known as AlterG®, reduces gravity’s impact on your lower body so you can begin rehabilitation sooner. 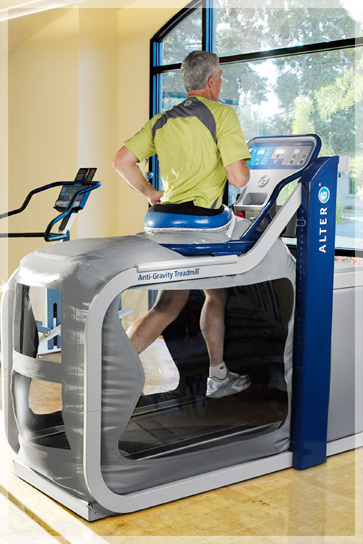 Everyone from injured athletes to older adults with mobility issues can benefit from the Alter G® treadmill. We can incorporate this equipment into your rehabilitation therapy program so you can train without pain and reduce the stress on your lower body joints and muscles. Whether you have a lower-body injury, chronic pain, or a neurological condition that inhibits your mobility, you can benefit from the capabilities of the anti-gravity treadmill. We are one of the only facilities in Delaware to have this cutting-edge machine. It is truly an amazing piece of equipment, and we’re lucky to have it at Delaware Back Pain & Sports Rehabilitation Centers. Come check out the AlterG® treadmill for yourself. We have AlterG® treadmills at our Omega and Glasgow locations. Call today for an appointment and to learn more about this technology.